Fetch compliments for your sense of style by wearing this pair of ballerinas presented by the popular brand, Truffle Collection. It features a rubber outer sole, which will offer optimum traction. In addition, its upper part has been made of superior quality synthetic leather that gives it a beautiful finish. 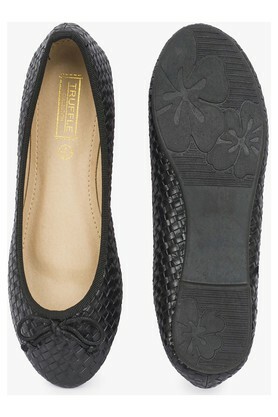 Make a distinct style statement by wearing this trendy pair of ballerinas on any casual occasion. It features a basket weave pattern and can be combined with a pair of jeans and a tunic for a chic look.